Lux Tenebrae is a setting of eldritch horror and conspiracy in a steampunk fantasy world that is reminiscent of post World War 1 Europe. Magic is rare and extremely powerful. Science and industry has taken precedence over faith. The majority of monstrous threats are rare or have been suppressed by the spread industrial civilization. Airships prowl the skys and iron golems are built in factories. The first major world war has just ended and the industrialized nations are struggling to pick up the pieces. Four years ago the greatest war the world had ever seen ended under an armistice, leaving in its wake an uncertain future for the nations of Eurona. As cities are rebuilt new tensions are rising and people struggle to find their destiny. The Great War left the continent in a state of endless political upheaval. It is a time of revolution, fear, and intrigue. Leaders fight for dominance in the halls of power with lies and assassins while most of their people starve and toil in fog choked cities. Behind every allegiance is an ulterior motive, behind every promise is deceit. But behind these shadows are even more sinister forces at work. During the Great War various nations sought uncanny means of victory when they realized that they couldn’t win by traditional tactics. They used forbidden magics and recruited madmen to create machines of dark science. In their efforts for better weapons of war they called forth forces beyond their comprehension, and awakened worse things. A constant flow of souls from a thousand battles coupled with destructive magics drew the attention of slumbering evil. Although the old gods still sleep, their dreams ripple across reality spilling over into the waking world. In their blind arrogance the nations of Eurona have paved the way to further horror in this strange world of dark science and madness. The world: Lux Tenebrae takes place on a planet called Valith. It is a large terrestrial world similar to earth with a single moon. The planet orbits a main sequence yellow dwarf type star and there is a total of 13 confirmed planets in the solar system. Valith is slightly colder then earth with conditions comparable to that of the little ice age. The main continent where most of the major Industrialized nations exist is called Eurona, the continent is similar in shape to that of Europe/Asia. The world has recovered from an ancient apocalypse: Long ago Valith was home to the Golden Empire, which spanned many different planes and wielded powerful technology and magic. The Golden Empire was brought to ruin in a divinely influenced apocalypse. Some say the dragons burned the old world to a cinder. Others think that the Penitent Ones, beings second only to the gods, had driven all sentient life to madness; turning all under the rule of the Golden Empire into little more then animals. No one is sure what really transpired during this forgotten era. The Long dead husks of titanic war machines and ancient tombs are all that remain. Magic and science exists as two sides of the same coin: Magic is uncommon and very powerful, but due to universal limits it can only go so far. So civilization branched on to a technological path. Steam powered machines and physical sciences drive industry and progress while magic enhances existing machines. Things like ironclad airships and sentient mechanical constructs are possible by combining elements of both magic and technology. Ironically magic is feared and regarded with suspicion by common people. Spell casters are born in this setting, not made; and from an early age spell casters are indoctrinated at Academies to loyally serve their nations as weapons of the state. Rogue spell casters are a major threat and are hunted with impunity by church inquisitors and specially trained mage hunters. Age of Imperialism and Revolution: Civilization is rapidly spreading to the furthest corners of the world and boarders between empires are constantly being redrawn after every war. Those subjugated by the expansionist powers aren’t happy toiling under their oppressive masters and fight hopelessly to break free. In other parts of the world the extreme opposite is true as rotting age old empires fight to maintain control over an increasingly disgruntled population. True monsters are rare, powerful, and terrifying: Many unusual races and creatures inhabit the world but true monsters lurk in the farthest most strangest places. They are large, terrifying and can strip the sanity off the minds of the strongest adventurers. Some are ancient magical beasts that have drifted into obscurity, others are outsiders that time has forgotten. All of them are a force to be reckoned with. The world is full of mystery and intrigue: Greedy companies, criminal enterprises, and deranged cults are constantly scheming and plotting in dark alleys while society remains largely oblivious to their activities. Neither is every thing what it always seems. Some times adventurers could find them selves allied with cultists and monsters with similar goals. All actions have consequences and most adventurers find that they have to be morally flexible in order to do good in the world. Dragons are strangely silent: Dragons are incredibly ancient magical creatures that where once heavily involved in the politics of the old world. But after the fall of the Golden Empire their numbers where reduced to a mere handful. Since then dragons have become living myths. People live their entire lives without ever seeing or hearing about one. The Gods are distant and mysterious: The age of gods and Demigods has long since passed. Knowledge of the gods and Astral Plane is mired in ancient myth and prophecy. As science has risen, the power of superstition and religion has diminished. Divine spell casters draw from the same source of power as arcane magic and in theory any spell caster can learn to cast divine spells, but without a divine sigil of a select god and strong faith, divine spells wont work. I like to think of my setting as a mix between Dragon Age, and Call of Cthulhu in a steampunk industrial fantasy setting with elements of Warhammer 40K and Eberron thrown in for good measure. In addition I am taking ideas (or outright stealing) from the Leviathan series by Scott Westerfield, Bioshock, Irongrip, and Full Metal Alchemist. If that’s all really confusing then just think of my game as a really weird Steamier version of Eberron. My game is not an epic fantasy, nor is it terribly realistic. My game is heavily inspired by early 20th century history. Things like World War 1 just give me a point in time that I can refer to for ideas. This is not an Alternate history game. I am also aware that my game is not “true” steampunk or dieselpunk but merely my own reiteration of it. Note that I am NOT a proponent of the “just add lots of gears and brass to make it steampunk” stereotype. Nor am I a Vernian purist that says that all Steampunk must be on earth or take place in 20th century Europe. Describing what “steampunk” is has been so warped that there is no longer a single definition for it. I found my own definition and that’s that! I am also aware that people don’t mix high fantasy with modern technology often; and for good reason, it usually doesn’t make much sense! The ripple effect of introducing something like gunpowder to a fantasy setting is massive and it takes a lot of work to figure out how it would change things. But some games and franchises find a way to make it work, I don’t see why I cant do the same. Legal Stuff – When possible I have credited original artists of any artwork used on this site and/or linked to the source that I found the piece. There is no intent to damage, defame or harm the work or artists in any way – if I have used your work it’s because I think it is beautiful and inspiring. Any requests to remove work will be promptly responded to. D&D and all the terms associated with the game are property of Wizards of the Coast and no infringement on their property is intended. This website is intended for the personal use and entertainment of our gaming group only, not for any monetary gain. I am only using the inspiration and not the source material. When my game actually starts I highly doubt that it will even remotely resemble a CoC game. 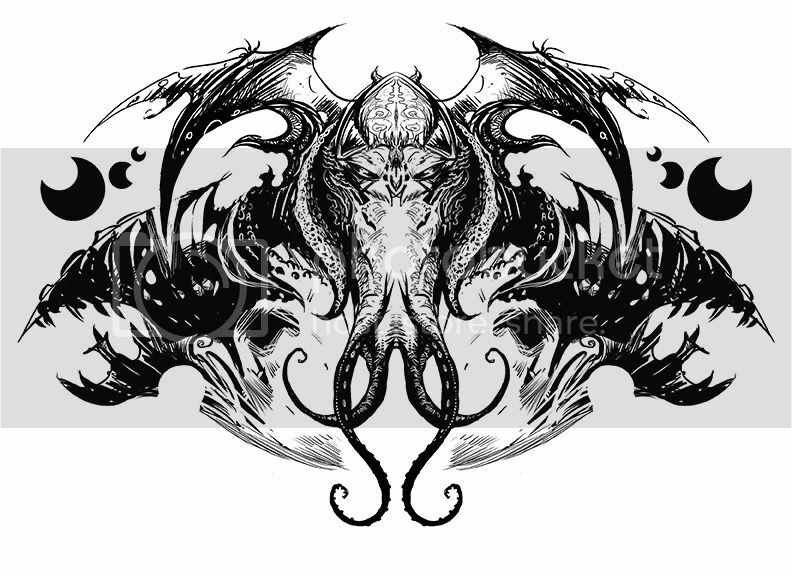 I have read alot of HP Lovecraft’s stories and I am drawing my inspiration from them for much of the lore in my campaign setting. Pretty interesting looking campaign you have building here. I’m pretty interested to see how you blend Steampunk & Cthulian (sic?) horror & D&D4e. Good luck!